It’s halfway through 2017, and we’ve received a lot of fantastic albums thus far. There’s still half a year to go and new albums to be released. Here is a list of albums to look out for! Don’t You Worry, Honey by Sir Sly which came out today. Saw You In A Dream EP by The Japanese House which released today. Unpeeled by Cage The Elephant (expected on July 28) that has “Whole Wide World (Unpeeled)” that can be heard. In other news, Paramore and PVRIS have announced a tour together in Mexico City on Oct. 23, Grayscale released the music video for “Come Undone” featuring Patty Walters using the footage shot during the “okay.USA Tour,” Turnover announced a tour across the United States called “USA 2017” which has Elvis Depressedly and Emma Ruth Rundle as special guests (tickets and tour information can be found here,) and Happy 10 year anniversary of Pierce The Veil’s album A Flair For The Dramatic and 5 year anniversary of Sleeping With Sirens If You Were A Movie This Would Be Your Soundtrack. This entry was posted in Music Updates, Updates and tagged Alternative Music, Arcade Fire, Foster The People, HAIM, neck deep, New Albums, PVRIS. Bookmark the permalink. Top 14 ICYMI Music News! The lineup for Music Midtown, a music festival in Atlanta, was announced with bands like Mumford & Sons, Blink-182, Weezer, and more. Tickets, lineup, and dates can be found here. Fall Out Boy released their second single “Champion﻿” that will be on their latest album set to debut on Sept. 15 via. Island Records. Foo Fighters released that a new album is in the future. Concrete And Gold will be released Sept. 15 via. Roswell Records and RCA Records. Issues announced a headlining tour, Headspace Tour, within the next few months. The tour will begin Sept. 24 in Fort Lauderdale, FL and end Nov. 3 in New Orleans, LA. Volumes will be accompanying Issues throughout the tour. Tickets and tour information can be found here. Paramore covered Drake’s song “Passionfruit” in BBC Radio 1 in London. You can hear the cover here. GoodDYEyoung, the hair dye company created by Hayley Williams, released four new hair colors: Ppl Eater, Kowabunga, Narwhal, and None More Black. Check out those shades and additional more on gooddyeyoung.com. Turnover stated that a new album will be released on Aug. 25 via. Run For Cover Records. Turnover parted ways with their guitarist, Eric Soucy and released a statement via. social media. This Wild Life is offering the chance for a fan to sing “Let Go” with them on their summer tour. The contest is going on now, just sing the bridge of the song and post it to Instagram with the hashtag #letgoguestvocals. The Amity Affliction has released their music video of their cover of “Can’t Feel My Face” famous by The Weeknd. You can hear the cover here. Envy On The Coast released a new song, “Sift” via. YouTube. The song will be off of their album Ritual out June 30. Touché Amoré announced a fall headlining tour across the United States on social media. Opening bands for the tour include Single Mothers and Gouge Away. Tickets and tour information can be found here. Echosmith shared a cover of Paramore’s “Hard Times” on various social media pages. You can hear the cover here. This entry was posted in In Case You Missed It..., Updates and tagged music news, Music Updates, New Albums, new music. Bookmark the permalink. Known for songs like “Coffee Talk” and “Storyteller,” Broadside has been taking the music scene by storm since their release of their first album Old Bones. The Virigina natives have toured with Real Friends, Forever Came Calling, State Champs, and many more bands. Broadside played at the 2016 Vans Warped Tour and went from a small stage to playing main stage in Las Vegas. It’s safe to say that they’ve grown to a bigger stage for a reason. If you haven’t checked out Broadside yet, I highly recommend checking out their music. I’ve seen Broadside perform with State Champs in the “Home For The Holidays” tour, at the 2016 Vans Warped Tour, with Forever Came Calling on a fall tour, and recently with Real Friends. I can’t wait to see them tour again and play more songs off of Paradise. What’s your favorite song off of Paradise? I’ve been loving “Laps Around a Picture Frame,” “Miss Imperius,” ﻿and “I Love You, I Love You. It’s Disgusting.” Let me know what’s your favorite by tweeting to me @ovictoriamedia. In other news, A Day To Remember announced a tour across the United States with Moose Blood and Wage War (tickets and tour information can be found here,) The Maine announced a tour across the United States with Night Riots and Dreamers (tickets and tour information can be found here,) PVRIS released a new song “What’s Wrong” via. YouTube. Hands Like Houses released a new song “Drift” and announced signing to Hopeless Records. Silverstein debuted “Lost Positives.” ﻿Also, this week the 10th anniversary for Paramore’s album Riot! and There For Tomorrow’s album A Little Faster had its 8 year anniversary. This entry was posted in Album Review, Music Updates, Updates and tagged Alternative Music, Broadside, Dorian Cooke, Hands Like Houses, Music Updates, New Album, New Broadside album, new music, Niles Gregory, Oliver Baxxter, Paradise, paramore, Pat Diaz, pop punk music, PVRIS, Silverstein, There For Tomorrow. Bookmark the permalink. 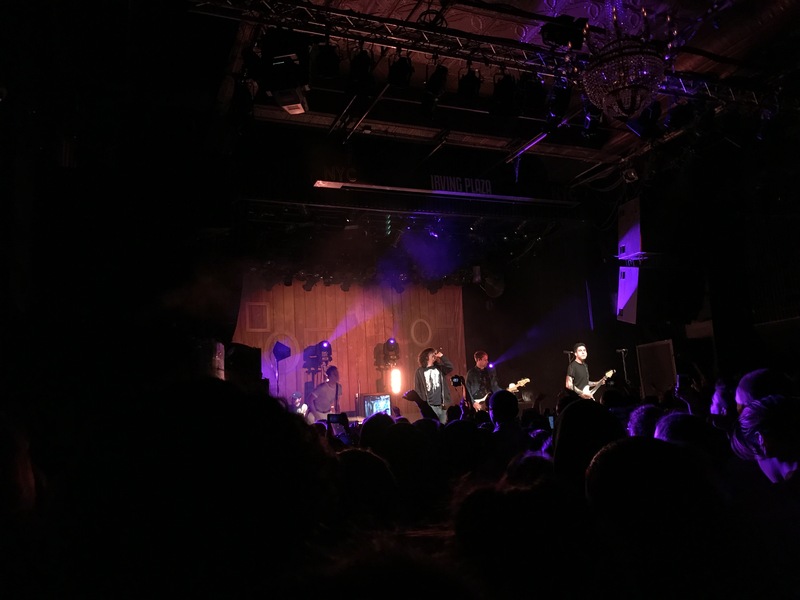 I saw Real Friends at Irving Plaza on June 2 on their spring tour. This is their only tour they’re embarking on in 2017. Accompanying Real Friends on this tour were: Tiny Moving Parts, Have Mercy, Broadside, and nothing, nowhere. I got to the venue early enough that I got the chance to see all of the opening bands. I’m a big fan of Broadside and was excited to see their set. I’ve seen Have Mercy prior to this tour with This Wild Life and overall, they were a good band with a large fanbase. After seeing all of the bands live, I’m looking forward to getting more in depth with their music. It’s safe to say that Real Friends put on a fantastic show, as usual. I like the fact that Real Friends played a lot of their latest album The Home Inside My Head and played their older songs like “To My Old Self” and “Floorboards.” If you haven’t seen Real Friends perform live, I highly recommend it. If you haven’t heard any of Real Friends music before, check out my blog post about their album The Home Inside My Head and listen to the song “Colder Quicker” and “Well, I’m Sorry” off of that album. Those songs are personal favorites of mine. I met All Time Low a few days ago, June 6, at Looney Tunes in West Babylon, NY. Unfortunately, there were no cameras allowed during the event. 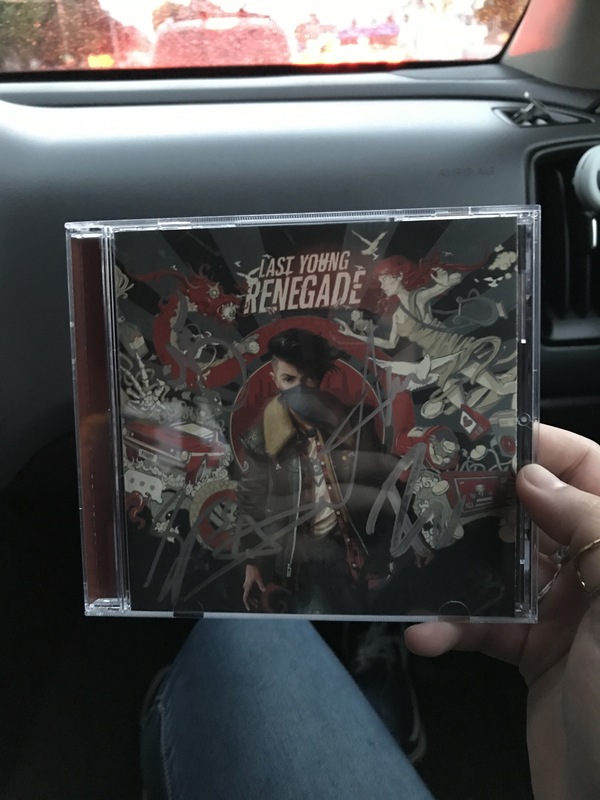 I waited about an hour on a line before going in to get their latest album Last Young Renegade signed. The album signing only took about a minute, and I was able to chat with Jack, Zack, Alex, and Rian. I wrote a blog post last week about the release of Last Young Renegade by All Time Low. Give it a read! This entry was posted in Concerts, Music Related Event, Music Updates, Updates and tagged All Time Low, concert review, Concerts, Real Friends. Bookmark the permalink. All Time Low released their latest album Last Young Renegade on June 2 via. Fueled By Ramen. This is All Time Low’s first album under Fueled By Ramen’s record label. All Time Low was under Hopeless Records and changed record labels last year. The public new about the label change on Feb. 17 via. Facebook with a statement by Alex Gaskarth. ﻿Within the time span of the statement on Facebook and the release of Last Young Renegade, All Time Low made public five singles: “Dirty Laundry,” “Last Young Renegade,” “Nice2KnoU,” “Life Of The Party,” and “Good Times.” Besides “Good Times,” every other single had a music video release with the song. Interesting enough, Jack Barakat tweeted explaining how “Good Times” was the first track written. As someone who grew up with All Time Low, it’s nice to see them mature as I do. I can’t wait to finally meet All Time Low next week. I’ll be sure to talk about my experience in next week’s post. What do you think of the album? Which song is your favorite? Let me know by tweeting it to me @ovictoriamedia. In other news, Neck Deep announced “The Peace and The Panic EU Tour” that goes around Europe and the UK throughout the months of October and November (ticket information can be found on their website,) The Maine announced a tour throughout the month of September with Night Riots and The Technicolors in Europe and the UK (tickets and tour information can be found here,) Blink 182 and PVRIS announced a show together in New York, Punk Goes Pop Vol. 7 is going to be released, according to Rock Sound, with bands like Too Close To Touch, Boston Manor, Capsize, and more. *I will be going to see Real Friends in Irving Plaza in NYC tonight and will be meeting All Time Low on June 6 at a local record shop. I will be writing about my experience for next week. This entry was posted in Updates and tagged Album Review, All Time Low, Alternative Music, last young renegade, neck deep, punk goes pop vol. 7, The Maine, Too Close To Touch. Bookmark the permalink.